Extrusion plays an important role in the plastics industry. Unlike molding, extrusion is a continuous process that can be adapted to produce a wide range of finished or semi - finished products, including pipes, profiles, sheets, film and wire covering. Extrusion machines are fitted with a variety of dies. Dies often require external heating to keep the plastic viscous. This is accomplished by using electric cartridge heaters inserted in holes in the die, or by other custom electric heating elements that are mounted to the die. After reviewing the application, BCE engineers quickly determined the heater was designed as a consumable part with limited operational life, and little to no serviceability. BCE was going to have to design a replacement heater that would not only be a drop-in retrofit, but would be built to last and easy to replace if needed. Continuous operating temperature of 200 °C. Minimal temperature deviation: ±2 °C. 10-32 tapped holes for custom terminal enclosure. Compatible with proprietary mounting fixture. Robust heater design to support long term continuous heating at 480 V in series . Heater plate designed for ease of access and serviceability. 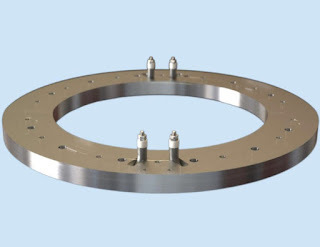 After generating all the necessary drawings and 3D models, BCE’s engineers successfully designed and manufactured a circular custom heater assembly to replace the customer’s original part. Custom tubular heaters were embedded into a machined aluminum ring. The positioning of the heater terminals were key to the ease of replacement and had to be carefully engineered. With this new, improved design, BCE was able to increase heater performance and efficiency, as well as guaranteeing temperature uniformity to within 2 °C around the periphery. Additionally, BCE modified the heater terminal electrical insulation to adequately support 240V (480V in series). Finally, the aluminum ring enclosure was designed to allow fast and easy replacement of the tubular heating elements, reducing down time and lost production.